Samsung 837 in the Meatpacking District. The initial locations include The Americana at Brand in Los Angeles, Roosevelt Field on Long Island in Garden City (N.Y.), and The Galleria in Houston. Visitors will be able to try and buy products ranging from phones to VR glasses and TVs, and -- much like Apple stores -- get in-person customer support, with walk-in repairs available for mobile devices. Samsung's U.S. retail footprint has so far consisted mostly of pop-up stores and dedicated spaces in chains like Best Buy. 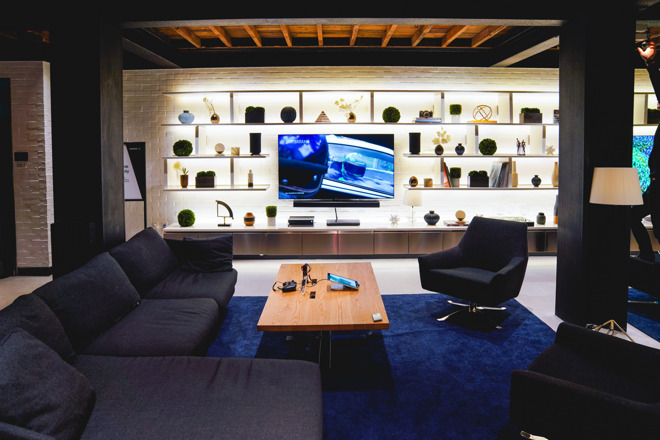 An exception is Samsung 837, based in New York City's Meatpacking District, but that space is foremost a showcase for the Korean company's technologies. Apple has long touted its retail stores as one of its key advantages, since people can try products in advance and have a place to turn if they need help with setup or troubleshooting. It remains to be seen if Samsung will be able to cultivate an equal or superior level of support, or if enough people will choose to shop at outlets instead of online or at the many third-party vendors that carry Samsung gear. Samsung has tried this approach in the UK. The effort failed due to low traffic, and was shuttered very quickly after opening. The company's Feb. 20 "Unpacked" event is expected to be its biggest in some time. On top of the Galaxy S10 and a still-shrouded foldable phone, it should also unveil a new Galaxy Watch, more fitness trackers, and wireless Galaxy Buds. The offensive comes at the same time as Apple is coping with declining iPhone sales, driven mostly by tough competition in China from local smartphone makers. This should work. They have enough products and enough US buyers to make this work, but they better consider their support center properly or this could all fail miserably. Apple's Genius Bar grew naturally as their sales rose dramatically and less technical-oriented people started buying their devices in droves—Samsung will be jumping in feet first with a lot of customers and a lot of sloppy design. They will not be quite as successful as the Microsoft stores are today. That is to say this move is for appearances only in an attempt to present themselves as a luxury brand when they are no such thing. Typically Apple looks at what others are doing and then improves on it and makes it uniquely Apple. Samsung just copies Apple and then proceeds to screw it up. I guess time will tell. Microsoft has lots of customers too. They have tried this before and it hasn’t worked out. Ssmsung makes very good tvs, appliances and more importantly phones which rival the iPhone. Consumers are fickle and the once fetish like product iPhone is just another mobile phone option although very expensive one at that. Think about with the release of every iPhone a Samsung is used at the best comparison by tech critics. I am not ready to switch to Samsung I just believe a younger generation does not necessarily feel they owe anything to Apple or it's products. MS doesn’t have a lot of HW, and when they started copyijg Apple’s stores they had even less. They stocked their store with PCs from other vendors and I assume they still do because their Surface offerings aren’t going to cut it. 1) No one should ever feel like they owe some loyalty to a brand (and that includes a sports team profiting from one’s misplaced fanatical loyalty). 2) It’s anecdotal, but I see more younger people with Apple products and more older people with Android products, usually from Samsung. Users that are less technical (across all age groups) and require the most help to do basic tasks, that usually falls to Android users. I thiink Apple will be fine. Perhaps this is in anticipation of 5G interconnectivity and they will showcase a wide range of products from refrigerators to smartphones, all made by Samsung all communicating. That's something Apple won't be able to do as easily. BY the way ma’am, would you like a refrigerator with your new Galaxy? If they stock their store with large items like home applicancs I think they’ll fail. Those items are large, dont sell in great numbers, aren’t a major draw like CE, and would have logisticsl issues in a typical store like Apple uses. i can see Samsung noting they have TV and home appliances, but I’d wager the focus will be on smartphones, headphones, tablets, PCs, and other CE. “Poised to challenge” with three stores? Click-baitly headline? Agreed, from warehousing, displaying and delivery, large appliances and even TV's take up a lot of space and not everyone has a car/truck that can fit a 65 inch tv. They can currently rely on retailers for delivery and installation, so unless they partnered with a 3rd party I don't see that happening. I think it will be focused on smaller CE devices. I don't think they will provide the same level of support/repair capability that you get in an Apple Store, which leaves me wondering how they plan to differentiate from Best Buy, Fry's or any other big box store. Anecdotal experience. I have an Galaxy S8 through my work, and its not a bad phone. Nice hardware, but it just falls short in some key ways. The Bixby button is flat out terrible and you can't truly deactivate or reassign it and battery degradation and performance have really became an issue(device is close to two years old). I would say it does 90% of things at a high level, but its just missing some of that final polishing I feel like you get with an Apple product. I'm thinking more of a challenge to traditional electronics stores rather than Apple. American teenagers prefer iPhone far above any other brand, at least as of 2018. It’ll probably be as empty as Microsoft stores. Appliance and TVs are commodities so I doubt those buyers will go directly to Sammy store is they wanted to compare multiple labels. Some of their stores were complete knockoffs with Apple designed rooms and Apple apps displayed. The one in the pic looks different. Good thing for them! Samsung doesn't make phones. They see what Apple is doing and make quick knockoffs. Why people give them any credit is beyond me. I remember when their knockoff iPhones were doing so bad they were giving away TVs with every purchase. I can see Sammy giving out free refrigerators with every iWannabe. If only the refrigerator has built-in 65" TV with X-ray, Netflix, Wi-Fi router, PlayStaion and a sink. Yes, why not. I think you are correct but they’ll need a whole lot more than 3 stores to challenge anybody! PS, I forgot to mention, I’d still rather buy an appliance or TV from Best Buy because warranty services. Aside from mobile phones, I don’t see them being able to handle services from their stores.